There is a meadow called “Devil’s Cemetery” not far from the village of Kova in the Krasnoyarsk region of Russia. The meadow is covered with remnants of birds and animals that for some reason do not decompose. Vegetation on the meadow is rather scarce, tree branches are charred, animals do not live here, and people who happen to come to the meadow develop headaches and unexplainable anxiety. They say that ruinous energy of the place has something to do with the fall of the Tunguska meteorite. Within one decade, from 1980 till 1990, about 75 people who went to search for the meadow perished in taiga. Three organized groups disappeared with no trace. For example, in 1992 a group of tourists from the city of Nabarezhnye Chelny left for taiga and never came back. None of the expeditions managed to reach the meadow. On several occasions researchers’ marked maps disappeared. The members of fraternal research group “Phenomenon” sent two expeditions to the area of the Devil’s Cemetery. But when they were about to reach the meadow, their equipment broke, and they did not take the risk of moving further. The leader of the expedition Nikita Tomin says:”After walking two kilometers in that direction, we came across a strange, partly collapsed structure located right on the creek. The examination showed that it was an old water mill. Next to it in the snow we found several forged nails typical for the beginning of the 20th century. We also found a couple of contemporary nails, but they were pretty old, too. Obviously, someone tried to repair the mill about 30-50 years ago. "It looked bizarre since the closest village was five or six kilometers away, and the mill was built in the thick of the woods. Probably, people who used to live here thought it was appropriate to build the mill right there so city people would not notice it. We left the mill alone and began moving further up the creek. We were walking, looking closely at snowy trees, trying to find an answer to a nearly 100 years old puzzle. But only gloomy silence of taiga was our companion." 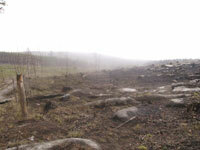 Tomin believes that the anomalies of the Devil’s Cemetery are connected with the fall of the Tunguska meteorite. In 1908, a “star fell off the sky” and shepherds went to look for it. On their way they stumbled upon a burnt area in taiga with a hole in the middle not far from the road where they pastured. The road was later moved three kilometers away since they worried that their cattle will wander off to the Devil’s Cemetery and die falling through the hole. But despite all this, cows continued to pasture in familiar places and did not avoid the Devil's Cemetery. Mass mortality of cattle forced the people of nearby villages Kostino, Chemba and Karamyshevo to move out. In the late 1920s, a livestock expert named Semchenko developed an interest in the meadow. He threw a rope with a load at the end into the hole in the center of the meadow. The rope fell several dozen meters, but never reached the bottom. Semchenko noticed that dead birds lay only near the hole, and their flesh was of a strange purple color. There is another version that explains this phenomenon. In the 1980s Victor Zhuravlev, a professor of physics and mathematics, a member of Meteorite Committee of the Siberian Department of the Academy of Science of USSR, suggested that an underground fire is slowly burning under the Devil’s Cemetery. A border of Tungus coalfield passes though that region. In case of lack of oxygen, coal burning is accompanied by the emission of colorless and odorless carbon monoxide gas that is poisonous for living organisms. However, this theory does not explain broken equipment or disappearance of maps.